Why, why, why I hear you say would you want to use Datasets with the Entity Framework? I’m not here to debate the whys and wherefores for doing this, just finding a simple solution to the problem. 99.9% of the time I would say don’t, but if you have a legacy system and all the code is driven by DataSet’s you have many choices. Each has their issues, the first could take some time, and would need full testing to ensure nothing had changed. Using an old style database connection, you might as well just use the old legacy code. What I’m going to be covering here is being able to call a Stored Procedure using the Entity Framework and return a dataset, this way the legacy code remains the same but allow you to utilise the Entity Framework for your connection. When solving a complex problem, it’s sometimes very tempting to choose an excellent solution. Not only will this solve the problem – but it will also impress your teammates and bring you everlasting glory. An even better solution, however, would probably be a boring one. One that is easy to understand, even for your junior colleagues. One that is well-known for your platform and language. One that is entirely not extraordinary. Using such a tedious solution means that you’re using simple vocabulary, which significantly increases the chances of everybody understanding you. This will make it a lot easier for everybody to follow along – including new team members (and yourself, a couple of weeks after you’ve written that code). Acronyms FTW! Car enthusiasts might now think of BMW, but software developers should think of KISS and YAGNI. “Keep it simple, stupid” should remind us that the simple solution will always beat the overengineered solution. The reasons why this is true are almost endless. And they might be easier to understand when looking at the opposite: complex code. Complex code is a perfect hiding place for mistakes. Complex code is hard to understand, for your coworkers and yourself. Complex code cannot easily be extended. Complex code cannot be reused. And, last but certainly not least, writing complex code will cause your teammates to brand you as an outlaw.When a more straightforward solution seems sufficient right now, you should always aim for it. When you realise that your solution isn’t essential at all, you should drop it. This is what YAGNI is about – “You ain’t gonna need it” reminds us to stay modest when planning the volume and scope of our implementations. Will users need this feature? Will they need this option within a feature? These questions, of course, will translate to our code: will we need that class/ module/routine? Thank God for StackOverflow.com. I seriously can’t imagine my (programming) life without it. And with it being one of the most visited sites on the web, I guess I’m not alone. After hours or even days of searching and trying different things, your shields are down. You are crawling through your code on all fours like a man who’s lost in the desert. But all of a sudden your search is fruitful! Eureka! Searching Stack Overflow has finally yielded a piece of code that works! That’s when you have to watch out and resist the temptation to take code that works for the system that’s good. What you’ve found on Stack Overflow is – in all but the rarest cases – not a solution but rather a clue. It can certainly make for a great pointer, but it was not written with your exact problem/ requirements/ constraints/codebase/application in mind. And sometimes, it might just be a dirty hack. Embrace Stack Overflow as a good source of guidance for specific problems. But also take the time to thoroughly and honestly evaluate if you’ve found a real, reliable solution. Sometimes, a solution is so beautiful, and you wish you had the right problem to apply it to. But unfortunately, issues come first. As impressive as your new screwdriver may be (imagine a handle made of gold, with your initials engraved, of course, if the problem at hand is to knock in a nail, it makes for only a less than perfect solution. 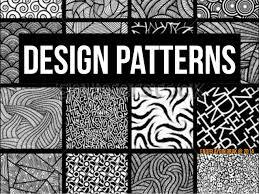 Now, after teaching you all I know about manual craft, let’s return to software development – and consider “design patterns” as your toolbox. Every design pattern you know (and understand) is an instrument in your toolbox. It’s certainly great to have many of them! The problems start, however, as soon as you let the patterns dictate your coding. They should be there to support you, to propose a proven solution – for the right problem! Programming paradigms should be used where they fit and not be enforced. Your components should be designed with your application’s requirements in mind – not with a beautiful design pattern. In cases where you’ve indeed found a helpful pattern for your current problem, there’s only one more thing: be sure to understand the pattern and its consequences on your coding. I’m sure you’ve used a third-party API at some point in your dev career – for example, to create new contacts in your CRM, to send emails through a newsletter service, or to do anything else with a third-party service virtually. If you’ve interacted with a couple of such APIs, you will undoubtedly have noticed some differences between them: using one was probably more pleasant than the other. It’s easy to see which API was designed thoroughly, by an experienced developer, and perhaps with a lot of effort and thought. And it’s just as easy to be frustrated with an API that was designed poorly and sloppily. The former was probably a joy to use, while the latter was perhaps… not. Since the effects are so visible, most developers tend to quickly agree that it’s almost a duty to design public APIs in a careful and thought-out way. 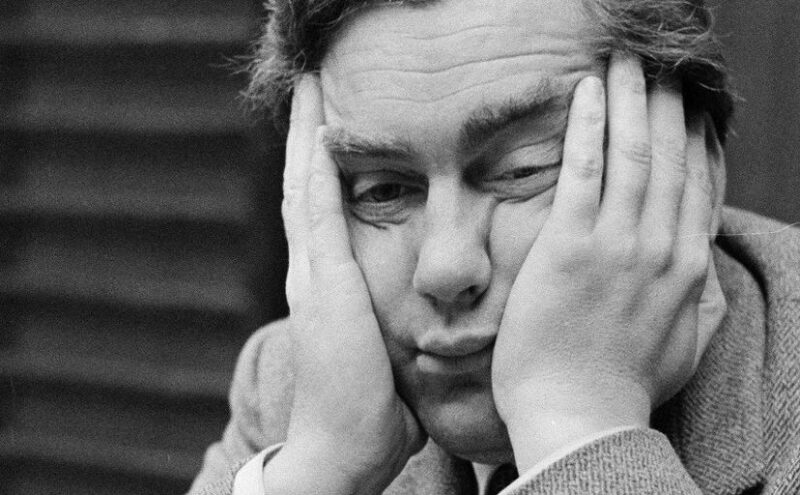 Nobody wants to work with a crappy API – and nobody wants to burden other developers with using their API being crappy. Modern software design puts great emphasis on the concept of “application programming interfaces”. However, as most developers already know, the idea goes a lot deeper and is not exclusive to a public interface. Instead, you should build APIs inside your application, for internal use, too. Approaching these internal APIs in the same way you’d create a public one can make a huge difference: your colleagues (and you) will want to interact with this part of your application. Making the interaction as easy as possible for these people is one of the best goals you can have. A secure, thoughtful API is probably the part of your software where quality matters the most. Your colleagues might forgive you a little sloppiness in the internals of this or that method. But they won’t (and shouldn’t) forgive you for creating a dangerous API. Some differences between ASMX and WCF services are subtle and some differences between them are not subtle. The purpose of this section is to identify many of these differences and to provide guidance for how to handle them when preparing for, or when performing, migration. ASMX provides a very successful baseline for services, and WCF extends those capabilities for the next generation of services. There are differences between ASMX and WCF, but it is important to also understand that WCF supports the same capabilities that ASMX provides. For example, you can use message types, XmlSerialization, custom SOAP headers, and Web Service Enhancements (WSE) in a WCF service. The remainder of this section describes some of these items; it also describes other areas that represent differences between ASMX and WCF. Serialization is the process of translating binary objects into a data format that can be transmitted across process boundaries, computer boundaries, and network boundaries. When serialized data reaches the destination, or endpoint, it can be deserialized back into binary objects for use by an application. Both ASMX and WCF use SOAP for messages passed between two endpoints. However, for serialization, each uses different classes that implement different rules. ASMX uses the XmlSerializer to translate classes into XML for communication, and to translate the XML back into classes on the receiver’s end. All public members are serialized unless they are marked as non-serializable using the XmlIgnoreAttribute. A large number of attributes can also be used to control the structure of the XML. For example, a property can be represented as an attribute using the XmlAttributeAttribute, or as an element using the XmlElementAttribute. The use of these attributes provides a great deal of control over how a type is serialized into XML; however, that power comes with an unfortunate downside. It may be possible to create XML structures that are not easily translated by other type systems, such as Java; XML structures that are not easily translated can hamper interoperability. WCF uses a DataContractSerializer to perform the same translation; however, the behavior is different from the XmlSerializer. The XmlSerializer uses an implicit model where all public properties are serialized unless they are marked with the XmlIgnoreAttribute, but the DataContractSerializer uses an explicit model where the properties and/or fields that you want to serialize must be marked with a DataMemberAttribute. It is important to note that WCF can also use the XmlSerializer to perform serialization operations. A notable difference between ASMX and WCF is the WCF ability to serialize class members regardless of the access specifier used. This means it is now possible to serialize private fields. Using this capability, you can encapsulate fields in a data type. For example, you can provide read-only access to a private field by implementing only the get method on a property. You can then serialize that private field by adding the DataMember attribute to the field in a WCF service. Another important difference is that the DataContractSerializer generates a simplified XML structure that increases its ability to interoperate between different operating systems. In addition, the ability for users to control the XML structure is limited. This simplified structure also means that future versions of WCF will be able to target this structure for optimization. Finally, in comparison to the XmlSerializer, the serialization of data is greatly improved with the DataContractSerializer. Using WCF, you can use the XmlSerializer for types that are already created. However, to maximize interoperability, it is recommended to use WCF data contracts and the DataContractSerializer. The Web Service Software Factory (ASMX) guidance package, also referred to as the ASMX guidance package, creates types that should also migrate to WCF data contracts if no additional XML serialization attributes, such as XmlAttributeAttribute, are added. The ASMX guidance package includes an XmlNamespaceAttribute to specify the namespace of the types. Developers can use the SOAP extensions feature of ASP.NET to interact directly with SOAP messages. By using SOAP extensions, you can intercept the SOAP message and insert your own code into the SOAP message pipeline, which allows you to extend the capabilities of SOAP. For example, features such as security, transaction management, routing, and tracing can be implemented by using SOAP extensions. The downside of this capability is that it reduces the SOAP message’s ability to interoperate with other operating systems. In other words, other operating systems may not be able to handle a SOAP message that has been customized. WCF does not support the use of SOAP extensions, but it does have other extensibility points that can be used to intercept and manipulate SOAP messages. For example, you can use a behavior extension to hook into the WCF Dispatcher with a class that implements IDispatchMessageInspector. Avoid the use of SOAP extensions when developing new ASMX services that will be migrated to WCF unless you are willing to rewrite them or if you are confident that WCF provides a similar capability. ASMX services use the HTTP transport protocol for communications with Internet Information Services (IIS) as the host. An ASMX service file has the file name extension .asmx, which is accessed using a Uniform Resource Locator (URL); for example, http://localhost/ASMXEmployee/EmployeeManager.asmx. Many different hosts can also be used with WCF services. For example, IIS can be used as a host with the HTTP transport protocol. Windows services and stand-alone applications can be used as a host for other transport protocols. Accessing a service hosted in IIS is similar to accessing an ASMX service; for example, http://localhost/WCFEmployee/EmployeeManager.svc. The only difference between the two services is the file name extension. However, you can also configure a WCF service to use the .asmx file name extension, as described in the Service Configuration topic. WCF services that use other transport protocols are accessed using methods associated with the specific protocol. When migrating an ASMX service to WCF, the protocol you choose is based on the client applications that will be accessing the service. If you need to support ASMX client applications, you also need to use the HTTP protocol. In addition, when configuring a WCF service for ASMX client applications, you need to configure the service to use BasicHttpBinding, as described in the Service Configuration topic. When migrating services from ASMX to WCF, and if ASMX client applications need to access the migrated service, use the HTTP protocol and configure the new service to use BasicHttpBinding. Typically, authentication and authorization with ASMX is done using IIS and ASP.NET security configurations and transport layer security. In addition, Web Service Extensions (WSE) can be used to provide additional security capabilities, such as message layer security. WCF can use the same security components as ASMX, such as transport layer security and WSE. However, WCF also has its own built-in security, which allows for a consistent security programming model for any transport. The security implemented by WCF supports many of the same capabilities as IIS and WS-* security protocols. However, when using IIS, you must also enable anonymous access to the service so that WCF security is implemented. A powerful reason for migrating an ASMX service to WCF is to take advantage of new security capabilities that are provided by WCF. For example, WCF provides support for claims-based authorization that provides finer-grained control over resources than role-based security. In addition, instead of depending on a transport protocol such as HTTP and extensions such as WSE, security is built into WCF. The end result is that security is consistent regardless of the host that is used to implement a WCF service. When possible, migrate both client applications and services to WCF to take advantage of the new security features that are available with WCF. Use of the WCF Security guidance package is also recommended when configuring security for WCF services and client applications. If a migrated WCF service must support ASMX client applications, you can use transport security associated with HTTP and HTTPS. You can also use WSE 3.0, but you must configure a custom WCF binding for this to work. For additional information about using WSE 3.0 with WCF, see Interoperating with WSE Sample on MSDN. With ASMX services, unhandled exceptions are always returned to client applications as SOAP faults. An ASMX service can also throw the SoapException class, which provides more control over the content of the SOAP fault that is returned to the client application. However, when an unhandled exception occurs, the default configuration of WCF protects sensitive data from exposure by not returning sensitive information in SOAP fault messages. You can override this behavior by adding a serviceDebug element to the service behavior in the configuration file that is associated with a WCF service. Overriding this behavior is not recommended for deployment; it should be used only in a development environment. Similar to the SoapException class used with ASMX services, you can also throw a custom exception by using the FaultException<T> type, where T is a data contract that contains the exception information. The use of custom exceptions also requires the declaration of a FaultContract on operations that will throw the exception. The following code example demonstrates how a DataContract is used to define a FaultContract declared on a service operation in a ServiceContract. This next code example demonstrates how to catch a FaultException that may be thrown by the service operation shown in the preceding code example. The filtering of exception data that is returned from a service is described using an Exception Shielding pattern. The pattern describes how exception handlers can be used to filter the data that is returned to a client application. To help facilitate the creation of exception handlers in WCF services, the Service Factory: Modeling Edition includes the Data Contract Model that contains a fault contract shape that you can use to create WCF fault contracts. WCF provides exception shielding, but you should always define exception handlers for both ASMX and WCF services. For more information, see Exception Handling in Service Oriented Applications. 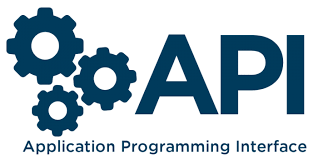 ASMX services have access to the HttpContext class, which provides access to state managers with a different scope, such as application scope and session scope. ASP.NET also provides control over how state data is managed. Consequently, you should minimize the use of state in a service because of the effect it has on the scalability of an application. WCF provides extensible objects that can be used for state management. Extensible objects implement the System.ServiceModel.IExtensibleObject<T> interface. The two main classes that implement the IExtensibleObject interface are ServiceHostBasedand InstanceContext. The ServiceHostBased class provides the ability for all service instances in the same host to access the same state data. On the other hand, the InstanceContext class only allows access to state data within the same service instance. To implement state management in WCF, you need to define a class that implements the IExtension interface, which is used to hold the state data. Instances of this class can then be added to one of the IExtensibleObject classes using the Extensions property. The following code example shows how to implement state using the InstanceContext. The ability to control where state is maintained in WCF is much more limited than in ASP.NET. As a result, state management is commonly used as the primary reason for enabling the ASP.NET compatibility mode, which provides access to ASP.NET components; this means you have much more control over where state is maintained. For example, when a service is configured for ASP.NET compatibility, you have access to HTTP context classes that provide the same functionality as the ASMX implementation. When developing new ASMX services, you should avoid the use of state in your services; all services should be stateless. Original source from Microsoft, edited and moved here as the content on Microsoft was in fear of being removed. Attributes are advantageous in C# to provide none business-related functionality in an application or to abstract out the code to make it easier to follow. The issue is when does the attribute code get called and how do you force it to run? I set the task on to write a simple console application showing different ways you can use attributes. The complex, component-style development that businesses expect out of modern software developers requires greater design flexibility than the design methodologies of the past. Microsoft’s .NET Framework makes extensive use of attributes to provide added functionality through what is known as “declarative” programming. Attributes enhance flexibility in software systems because they promote loose coupling of functionality. Because you can create your custom attribute classes and then act upon them, you can leverage the loose coupling power of attributes for your purposes. Lucky for us, the designers of the .NET framework did not choose to keep these metadata “goodies” hidden away under the covers. The designers gave us the Reflection API through which a .NET application can programmatically investigate this metadata. An application can “reflect” upon any imaginable aspect of a given assembly or on its contained types and their members. With all this positive news about .NET metadata, it seems hard to believe there could be anything more to the story? But there is. You can create your application-specific metadata in .NET and then use that metadata for any purpose you can imagine. Developers define their application-specific metadata through the use of Custom Attributes. Because these attribute values become just another part of the metadata bound into an assembly, the custom attribute values are available for examination by the Reflection API. In this article, you’ll learn how to define custom attribute classes, how to apply attributes to classes and methods in your source code, and you’ll learn how to use the Reflection API to retrieve and act upon these values. How Does .NET Use Attributes in the Common Language Runtime? Before you start to consider what you can accomplish with your custom attribute classes, let’s examine some of the standard attributes that the Common Language Runtime already makes available. The [WebService] attribute provides a simple example? It lets you turn any public method of a WebService subclass into a method that you can expose as part of the Web Service merely by attaching the [WebMethod] attribute to the method definition. You just attach the [WebMethod] attribute to the method, and .NET handles everything else for you behind the scenes. Indicates that the UnitTest( ) method of this class is “conditional” based on the presence of the preprocessing symbol “DEBUG”. The fascinating part is what happens. The compiler stubs out all calls to the method when the condition fails rather than attempt to nullify the behaviour of the method the way an #if…#endif pre-processing directive does. This is a much cleaner approach, and again we didn’t have to do much of anything to utilise this functionality. Attributes utilise positional and/or named parameters. In the example using the [Conditional] attribute, the symbol specification is a positional parameter. You must always supply positional parameters. Named parameters are optional, and you write them using the name of the parameter followed by the assignment of a value. Named parameters follow after you’ve specified all positional parameters. I will talk more about named and positional parameters later in this article when I show you how to create and apply your Attribute class. The examples provided in this article are involved in run-time activities. But Binaries (assemblies) aren’t just for run-time. In .NET, the metadata you describe isn’t limited to being available only at runtime. You can query the metadata at any time after you’ve compiled an assembly. Think about some design-time possibilities. The open nature of the IDE in Visual Studio.NET allows you to create tools (using .NET languages) that facilitate development and design (wizards, builders, etc.) Thus, one module’s run-time environment (the IDE tool) is another module’s design-time environment (the source code being developed). This presents an excellent opportunity to implement some custom attributes. You could allow the IDE tool to reflect and then act upon the source classes/types you develop. Unfortunately, due to the additional subject of the IDE tool code, exploring such an example is beyond the scope of a single article. The standard .NET attributes contain a similar example. When a developer creates custom controls to include in the Toolbox of the Visual Studio .NET IDE, they have attributes available to them to indicate how to handle the control in the property sheet. Table 1 lists and describes the four standard .NET attributes that the property sheet uses. These property sheet-related attributes make it clear that you can use attributes and their values in the design-time as well as in the run-time environment. Apparent similarities exist between attributes and regular member properties of a class. This can make it difficult to decide when and where you might want to utilise a custom attribute class. Developers commonly refer to properties of a class and their values as being “attributes” themselves, so what is the difference between properties and attributes? An attribute takes the same “shape and form” as a property when you define it, but you can attach it to all manner of different assembly level types?not just Classes. Table 2 lists all the assembly level types that you can apply attributes. Let’s pick one item from the list as an example. You can apply an attribute to a parameter, which is a little bit like adding a property to a parameter? A very novel and powerful idea indeed, because you just can’t do that with class member properties. This emphasises the most significant way in which attributes and properties are different because properties are just always going to be members of a class? They can’t be associated with a parameter or any number of other types listed in Table 2 different than Class. Member properties of a class are also limited in another way in which attributes are not. By definition, a member property is tied to a specific class. That member property can only ever be used through an instance or subclass instance of the class on which the property was defined. On the other hand, you can attach/apply attributes anywhere! The only requirement is that the assembly type the attribute is being assigned to matches the validon definition in the custom attribute. We’ll talk more about the validon property of custom attribute classes in the next section. This characteristic of attributes helps to promote the loose coupling that is so helpful in component-style development. Another difference between properties and attributes relates to the values you can store in each of them. The values of member properties are instance values and can be changed at run-time. However, in the case of attributes, you set values at design time (in source code) and then compile the attributes (and their values) directly into the metadata contained in an assembly. After that point you cannot change the values of the attributes?you’ve essentially turned the values of the attributes into hard-coded, read-only data. Consider this when you attach an attribute. If you attach an attribute to a class definition, for example, every instance of the class will have the same values assigned to the attribute regardless of how many objects of this class type you instantiate. You cannot attach an attribute to an instance of a class. You may only attach an attribute to a Type/Class definition. Now we’ll create a more realistic implementation of the ideas presented above. Let’s create a custom attribute class. This will allow us to store some tracking information about code modifications that you would typically record as comments in source code. For example, we’ll mark just a few items: defect id, developer id, the date of the change, the origin of the defect, and a comment about the fix. To keep the example simple we’ll focus on creating a custom attribute class (DefectTrackAttribute) designated for use only with classes and methods. Listing 1 shows the source code for the DefectTrackAttribute class. You can identify some critical lines of code. If you haven’t used attributes before, the following line of code might look a bit strange. This line attaches an [AttributeUsage] attribute to the attribute class definition. Square bracket syntax identifies the construct as an attribute. So, Attributes classes can have their attributes. This may seem a bit confusing at first, but it should become more evident as we show you what you’ll use it for. The [AttributeUsage] attribute has one positional parameter and two named parameters. The positional parameter validon specifies which of the various assembly types you can attach this attribute to. The value for this parameter uses a combination of values from the AttributeTargets enumeration. In my example, I allow only classes and methods, so I get the proper specification by OR’ing the two AttributeTargets values together. The first named parameter of the [AttributeUsage] attribute (and the only one specified in the example) is the AllowMultiple parameter, which indicates whether you can apply this type of attribute multiple times to the same category. The default value is false. However, you want to use the AllowMultiple parameter of the Attribute more than once on a single type because that represents what the example will model. A given method or class potentially goes through many revisions during its lifetime, and you need to be able to denote each of these changes with an individual [DefectTrack] attribute. The second named parameter of the [AttributeUsage] attribute is the Inherited parameter, which indicates whether or not derived classes inherit the attribute. I’ve made the default value for this parameter false. I opted to take the default value, so I did not specify this named parameter. Why? The source code modification information I want to capture is always related to each class and method individually. Would it confuse the developer for a class to inherit the [DefectTrack] attribute(s) from its parent class? The developer couldn’t distinguish which [DefectTrack] attributes came from the parent and which were specified directly. Listing1 then lists the class declaration. Attribute classed are subclassed from System.Attribute. You will directly or indirectly subclass all custom Attribute classes from System.Attribute. Next, Listing 1 shows that I’ve defined five private fields to hold the values for the attribute. The first method in our Attribute class is the class constructor, which has a call signature with three parameters. The parameters of a constructor for an Attribute class represent the positional parameters for that attribute, which makes these required parameters. If you choose, you can create overloaded constructors and have more than one proper positional / configuration of parameter needed. The remainder of the Attribute class is a series of public property declarations that correspond to the private fields of the class. You’ll use these properties to access the values of the attribute when you get to the example that examines the metadata. Note that the properties that correspond to the positional parameters only have a get clause and do not have a set clause. This makes these properties read-only and communicates with the fact that these are meant to be positional and not named parameters. You’ve already seen that you can attach an attribute to a target item in your C# code by putting the attribute name and its parameters in square brackets immediately before the item’s declaration statement. 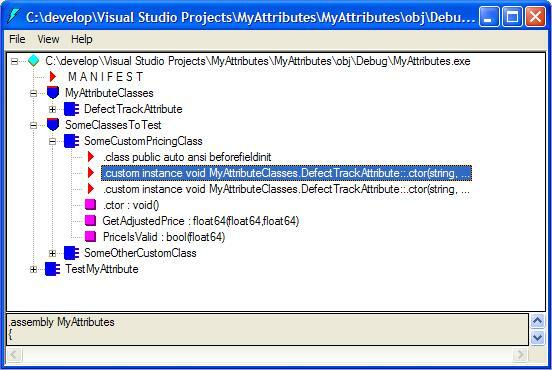 In Listing 2 you attach the [DefectTrack] attribute to a couple of methods and a couple of classes. You need to ensure that you have access to the class definition for your custom attribute, so you start by including this line. Beyond that, you’re merely “adorning” or “decorating” your class declarations and some of your methods with the [DefectTrack] custom attribute. SomeCustomPricingClass has two uses of the [DefectTrack] attribute attached. The first [DefectTrack] attribute uses only the three positional parameters whereas the second [DefectTrack] attribute also includes a specification for the named parameter Origin. The PriceIsValid( ) method also uses the [DefectTrack] custom attribute, and it includes a specification for both of the named parameters, Origin and FixComment. Listing 2 contains a couple of additional uses of the [DefectTrack] attribute that you can examine on you own. Some readers might wonder if you could rely on the old-fashioned approach of using comments for this sort of source modification information. .NET does make tools available for using XML blocks within comments to give them some structure and form. You can easily see a comment in your source code right at the relevant place. You could process such information by text parsing the comments in the source, but it’s tedious and potentially error-prone. .NET provides tools to process XML blocks in comments that practically eliminate this issue. Using a custom attribute for the same purpose also provides you with a structured approach to recording and processing the information, but it has an added advantage. Consider that after you compile source code into a binary, you lose your comments?forever removed from the byproduct executable code. By comparison, the values of the attributes become a part of the metadata that you’ve permanently bound to the assembly?you have still had access to the information even without any source code. Additionally, the way an attribute “reads” in source code allows it to fill the same valuable design-time function still that the original comment did. At this point, even though you’ve applied your custom attribute to some classes and methods, you haven’t seen it in action. It seems as if nothing indeed occurs whether you attach the attributes or not. But something does happen and you don’t have to take my word for it. You can use the MSIL Disassembler to open an EXE or DLL that contains types you’ve decorated with your custom attributes. The MSIL Disassembler lets you see that .NET included your attributes and their values right there in the IL code. Figure 1 shows an example of ILDASM form with the EXE from the sample code in this article opened. Despite seeing the attribute values in the disassembly as proof of their existence, you still haven’t seen any action related to them. Now you’ll use the Reflection API to traverse the types/objects of an assembly, query for your custom attribute, and retrieve the attribute values when you find types that have your custom attribute attached to them. Consider the general structure and intent of the test program in Listing 3. The program loads the specified assembly, gets an array of all members of the assembly, and iterates through each member looking for classes that have the [DefectTrack] attribute attached. For classes that have the attribute, the test program outputs the values of the attribute to the console. The program then performs the same steps and iteration for methods. These loops “walk” their way through the entire assembly. Now examine some of the more critical lines of code. The first line and second line of the DisplayDefectTrack( ) method retrieve a reference to an Assembly object by loading the specified Assembly and then extracts an array containing all of the types in the assembly. A FOR…EACH loop iterates through each of the types of the assembly. The program outputs the name of the current type to the console, and then the following line of code queries the present type for an array containing [DefectTrack] attributes. You specify the parameter typeof(DefectTrackingAttribute) on the GetCustomAttributes() method so that you can limit the returned custom attributes to be only of the type that you created in the example. The second parameter of false indicates that you do not want to include the type’s inheritance chain when trying to find your attributes. A FOR…EACH loop iterates through each of the custom attributes and outputs its values to the console. You should recognise that the first line of the FOR…EACH block creates a new variable and does a typecast against the current attribute. Why is this necessary? The GetCustomAttributes() method returned an array that contains references that get cast to the generic type Object. You want to gain access to the values from your custom attribute class, and to do so, you must recast these references to their actual concrete type, DefectTrackAttribute. Once you’ve completed this, you can use the attributes, and the program can output the attribute values to the console. Because you can apply your attribute to either classes or methods, the program then calls the GetMethods() method of the current type object from the assembly. For example, we have chosen to pass some values from the BindingFlags enumeration to GetMethods(). These three BindingFlags, when used in combination, limit the methods returned to ones that you defined directly in the current class. I wanted to limit the amount of output in the example, but you probably would not do this in practice because a developer might apply the [DefectTrackAttribute] to an overridden method. My implementation would not catch those attributes. The remaining code does virtually the same processing for each of the methods that it did for each of the classes? The code queries each method for custom attributes of the [DefectTrack] type and then outputs the values for the ones it finds to the console. This is just presented the implementation as only one example of how a developer might use .NET attributes to enhance their development process. Custom attributes are a bit like XML in that the significant benefits aren’t related to “what it does.” Custom attributes’ real interests lie in “what you can do with it.” The possibilities are truly limitless, and the open nature of custom attributes makes it likely that some of their most novel and powerful uses have yet to be conceived of. Table 1: Standard .NET attributes that the property sheet uses at design-time in the Visual Studio .NET IDE. Designer Specifies the class used to implement design-time services for a component. DefaultProperty Specifies which property to indicate as the default property for a component in the property sheet. Category Specifies the category in which the property will be displayed in the property sheet. Description Specifies the description to display in the property sheet for a property. Table 2: .NET assembly level types that you can apply attributes to.